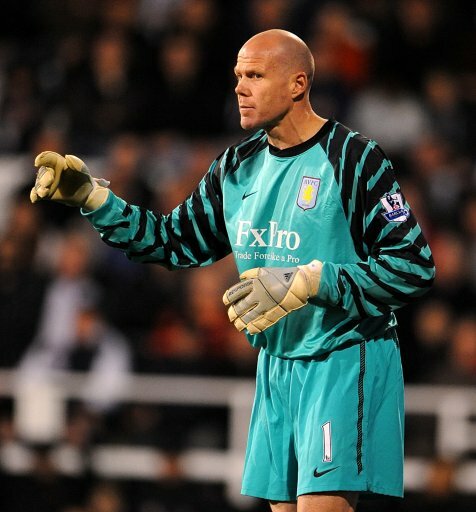 Aston Villa’s American goalkeeper Brad Friedel has been declared bankrupt in his homeland, after his non-profit football academy in Lorain, Ohio racked up debts of almost £5 million after failing to attract enough hopefuls willing to pay the annual £20,000 membership fee. Incredible. Friedel has already seen repossession proceedings taken against him, which began on the £260,000 house he owns in Ohio. The veteran stopper set up the academy in 2007, explaining that he didn’t intend to make any money from it, rather provide a ‘platform for the nurturing and promotion of local footballing talent’ – though it seems that our Brad forgot to pay the taxman for the privilege, with the Lorain County Auditor’s website listing more than £250,000 in unpaid property fees relating to the site. Yeah, I’m from the Greater Cleveland, Ohio area where Brad is from (his hometown of Lakewood is very close to Lorain and Cleveland). My uncle who was also a goalkeeper was in a local high school all-star team with Brad, so he knew him a bit when they were growing up, and he said a few years ago was that the only reason he was still playing was because he was in so much debt because of this thing. I’ve heard that he actually owes a decent amount of money to some other players (many of whom have since retired) who he tried to get to invest in the academy as a money-making venture after they left the game. And believe me, they were looking to make money. The whole idea behind the thing was to get the best local kids to play at the academy (Cleveland has a huge immigrant population and a ton of local clubs along with developing college soccer power Akron only a half hour away) and then sell them on to European clubs if they were good enough. Anyway, I don’t know if everything I’ve heard is true, but that’s what I’ve picked up being a bit closer to the situation. Cheers Grant. Your Stateside input, as always, is very muchly appreciated. The problem with setting up academies in the states is that you have to compete with the very well established and entrenched NCAA sports scene. America’s best athletes usually play 2 or 3 sports growing up, but the most money and popularity in terms of college sports is in basketball and American football. I think the only way one of these ‘family owned’ academies would work if he set it up in conjunction with one of the MLS clubs. The problem (or at least one problem) is that any players in Ohio wanting to go to an academy would be best served by playing for the local professional team’s (the Columbus Crew) academy. Who would turn down the opportunity to play for free in a professional team’s youth setup to pay 20 large a year for an unproven academy? £20,000 a year membership fee, I wonder why it never worked? Isn’t that how much it probably costs to send your kid to Eton a year? Go back and open a baseball academy, that’ll get lots of young hopefuls. So the first year the academy did not charge at all. Then some of the sponsors pulled out and they had to try and start charging. It was a great concept but one that just didn’t work in the U.S. They were, indeed, looking to use the fees that would be paid to the academy from any players siging overseas to support the academy. Unfortunately, USSF still does not allow this. Puts the U.S. at a huge disadvantage.